Depth of field is one of the key creative tools in a photographer’s armoury. Shooting with a wide aperture creates a shallower depth of field in the image, allowing the photographer to make only a selected portion of the image sharp, with the rest of the image artfully blurred. This use of what is often called ‘selective focus’ can draw attention to one area of the image, and one element of the subject. As an example, in portraiture it can draw attention to the eyes. In plant photography it can pick out one flower amongst many. Read the full brief by clicking 'The brief in detail' tab (above). The expert's winner and the crowd's winner will both receive Rocky Nook's brand new The Complete Guide to Macro and Close-up Photography (released in March 2016) by Cyrill Harnischmacher. The technical aspects of shooting selective focus imagery are relatively straightforward. Shooting in Aperture Priority mode is a good idea. Set a wide aperture (which means a smaller number, such as 2 or 2.8). Fixed lenses have wider maximum apertures than zoom lenses, and on fixed lenses the widest aperture may actually be too wide for the desired effect. The wide aperture allows more light in, so shutter speeds are faster, usually negating the need for a tripod during daylight. The closer you are to your subject, the shallower the depth of field will be at any given aperture. Shooting close-up subjects like plants, insects or head-shot portraits will therefore allow for the best use of selective focus, but many other subjects can also benefit from it. Finally, if you are focussing on one very specific part of the subject, it’s very important that that area is actually sharp. Shoot a few versions to ensure that you’ll have at least one shot that has the selective focus in exactly the right place. 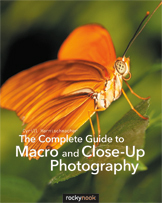 The expert's winner and the crowd's winner will both receive Rocky Nook's brand new The Complete Guide to Macro and Close-up Photography (released in March 2016) by Cyrill Harnischmacher. The highest-placed entries will feature on Photocrowd's 'Best images' page and social media channels.